In the wake of Griffin's Survivor cases being released, the Explorer is part of Griffin's Armored line of tough cases for the Verizon and AT&T iPhone 4, iPad 2 and the iPod Touch 4G. It took a while for the Explorer case to come out even though it was already advertised on the Survivor case packaging along with the unreleased Tracker case, also a part of the Armored series. The Griffin Explorer case for the iPhone 4 is suitable for those who are not looking for the ultimate military-spec proven protection that the Survivor case has to offer. The Explorer is relatively built in the same way as the Survivor with a shatter-resistant polycarbonate inner frame and a durable, flexible outer silicone jacket for shock absorption. Built-in Port plugs tuck in to keep dust and dirt out of the iPhone 4's dock connector, camera lens, audio port and speaker openings. The only exclusion setting the Survivor apart from the Explorer is the built-in screen protector and a bit more silicone to go around. 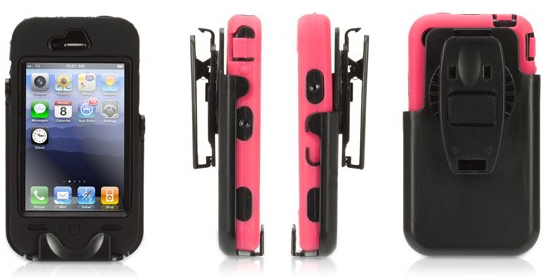 The Explorer case for the iPhone 4 is available now in black and pink for $39.99, and comes with an included belt clip.